← “Like” me on facebook! The highly distinctive thistle shapes of Thistle by Edinburgh Crystal are embellished with a complex geometric pattern and delicate engravings . I consider this pattern to be among my favorites! This classic design, which has remained largely unchanged for more than a century, displays the exceptional skill and quality for which Edinburgh Crystal was renowned. In my new book, The Collected Tabletop, I used the Thistle pattern on my “Scottish Gamekeeper’s Dinner” table. 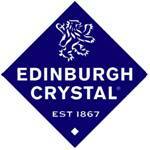 The Edinburgh Crystal Company was founded in 1867 and was in business until 2006. At that time the brand was purchased by Waterford Wedgwood. The thistle pattern was made in a variety of pieces, including wine,champagne, brandy and whisky glasses, and wine and whisky decanters. Although no longer manufactured, many pieces are available through Replacements! Visit my website to order your copy of The Collected Tabletop today! This entry was posted in Pattern of the Month and tagged Crystal, Edinburgh Crystal, Pattern of the Month, The Collected Tabletop, Thistle, Waterford Wedgwood. Bookmark the permalink. This looks like it is going to be right up my alley – I can’t wait to get it! Thank you for sharing great ideas. I have Edinburgh Cryastal Thistle that was given to me, but the pieces are cut but the flower is not etched on them. Are they saleable? I imagine that they would be. I would suggest that you call my great friends at Replacements, Ltd. in Greensboro, NC and talk with them about these pieces. Good luck and let me know if I can be of additional help. (not that this is much help!). I have a good collection of Mint condition Edinburgh Thistle range that I am looking to sell, whisky decanter, wine decanter, whisky glasses, wine goblets etc. If anyone is interested please get in touch. Call or email me.. glennprosser@allaboutdogs.nl or 0031653777383. Thanks, I know a couple of people who want to start a collection of Thistle know about the pieces you have and give them your contact information! It is such a lovely pattern and I enjoy my Thistle so very much! Thanks Kathryn, I still have them for sale as of July 2013. Details below again. Call or email me.. glennprosser@allaboutdogs.nl or 0031646888860. Are there still pieces available? No, I am sorry that they are not. Hi I have approxiamately 50 pcs of unused thistle crystal that I want to sell do you have people enquiring on such articles. Yes we do James. Feel free to contact my office at 828-734-6382 or info@kathryngreeleydesigns.com with an inventory and prices and we will be happy to pass that along to some clients who might be interested. I have a variety of thistle crystal for sale. I am staying in South Africa, what is the best way to sell these? I am not really sure. You might contact Replacements (www.replacements.com) and see if they have any interest in it. I would be interested in Edinburgh Crystal Thistle pattern – with or WITHOUT the etching.